Scott Whitaker is saving the region's bees, one hive at a time. Spring has arrived early in the hinterland and Scott Whitaker is inspecting the beehives he quarantines on his property after rescuing them from the walls of schools, industrial buildings and homes across the Sunshine Coast and Brisbane. Under a clear cerulean sky, he opens each hive and looks for signs of disease. He’s not wearing gloves – it’s easier to handle the hives with bare hands and besides, getting stung is just something you have to get used to as a beekeeper. The European honey bee – Apis mellifera – is not aggressive like the Africanised honey bee, he assures me, as I edge tentatively towards the open hives. And let’s not forget the pièce de résistance: honey – the amber elixir of the gods. “The bees are pretty friendly,” Scott says. “You can stick your hand right in there if you’re gentle and pull out the comb and the bees will move away. If you get stung, it’s usually when you’re trying to handle the product. If a bee stings you, it’s almost an accidental thing. Even a dead bee will sting you if you squash it. He’s handed me his veil to wear today and through the white mesh, I survey the surrounds. The 15-acre property in North Maleny slopes steeply down from the road. The hives are located on a landing halfway down the hill and Scott and wife Allyson Reynolds’ home is tucked away in the valley below. Velvety green hills encircle the property and the Obi Obi Creek bubbles around its lower perimeter, with rainforest pockets flourishing along its banks. Scott and Allyson have planted more than 3000 bee-friendly trees, including a flourishing orchard. It’s about as idyllic as it gets. This softly spoken couple are artists and can happily spend days in their peaceful hideaway without leaving, with their two dogs and thousands of bees for company. The kids have grown up and moved out and without the daily routine of school runs and lunches, they have time to concentrate on their passions for art, bees and a business that combines it all, allowing them to live a lifestyle that keeps them busy without being stressed, as well as in touch with nature and each other. 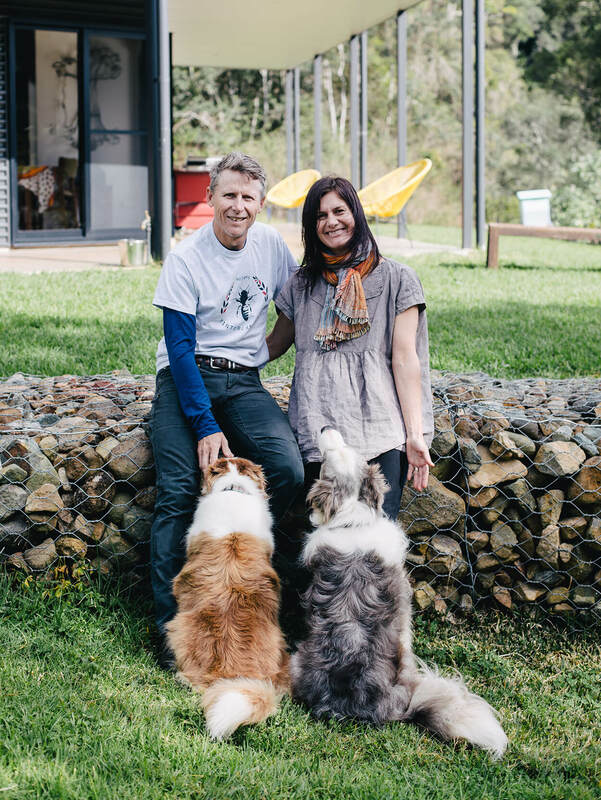 Scott and Allyson met at art school in Brisbane in 1989, and in 1993 they bought an old warehouse in Newstead, which they transformed into the Doggett Street Studio, a gallery they ran for 20 years. In 1998 they moved to Dayboro and Scott began commuting to the gallery. It was in Dayboro, at Allyson’s insistence, they got their first beehive. After enduring 10 years of drought, they upped sticks and moved to Maleny in 2010. While Allyson has continued with her art, Scott has found himself swapping brushes for bees. Their business, Hinterland Bees, is a multi-pronged affair that sees him managing hives for hobbyists (including the nifty Australian invention Flow Hive, which gives you honey on tap), producing his own raw honey to sell to the local IGA and rescuing wayward hives from the pest control man. Of Scott’s 75 hives dotted around the hinterland, from Maleny to Dulong, about half of them are rescue hives. His role as a bee rescuer began in 2014, when a friend asked him to help remove a swarm of bees that had set up home at a school in Bald Hills. “I went and collected that swarm and asked if they knew where the swarm came from,” Scott says. “They said, ‘we’ve got a hive in the wall of the gymnasium’. It had been there a few years and they’d tried to get rid of it. I put in a swarm lure trap – it’s a smaller hive you mount with some frames and lemongrass oil, which imitates the queen’s pheromones. It will attract the scout bees and hopefully they’ll move in there. During busy times – traditionally spring and summer – Scott gets a call about once a week to rescue a hive. This year, the bees thought spring had come early and started to swarm in winter. Scott feels it’s a sign of climate change in action. “They love brick veneer houses – they have those little weep holes in the bricks,” he says. “They go in there and they have a warm cavity. If a wall has insulation the bees won’t move in because there’s no space. They look for a cavity of a certain size. When they end up in a building, quite often people will call a pest controller and a lot of them will just come and happily poison the bees. Scott shares photos and videos of his method for humanely removing beehives from inside wall cavities on Instagram and Facebook and has a growing following. “The process of doing a cut-out is where you open up the wall. You’ve got a fair idea of where the queen is – she’ll be in the brood nest. I start cutting out all the honey first and vacuuming up the bees using a special vacuum that doesn’t harm them. I’m searching for the queen during that whole process. When you get into the brood nest, you cut out the brood comb and put that into frames that you can then put inside a hive. I use rubber bands to hold it in there. A cut-out usually takes most of the day, depending on the size of it. I put the queen in a clip – I usually find her close to the end of the process. She’s pretty good at evading capture. Of even greater concern is the varroa mite, a tiny parasite that has decimated bee populations in the US and Europe. Almost every bee there has the virus that’s transferred by the mite, and while Biosecurity Australia has done an admirable job of keeping it out, experts say it’s not a matter of if it spreads through our bee populations, but when. Sentinel bee hives are set up at all ports for monitoring, but in 2016, the varroa mite was detected on Asian honey bees in Townsville. The Department of Agriculture and Fisheries established the National Varroa Mite Eradication Program in response. “The longer we can hold off on it, the more likely we’ll be able to import bees that have been bred to resist the mite,” Scott says. “There’s been a lot of breeding to find bees that are resistant. There’s also a strain of bees that chew the leg off the varroa mite and it bleeds to death. These are two rays of hope. Scott’s now taking his passion for saving bees into the tech realm, developing an app that will allow beekeepers to improve their record keeping and manage their hives. He and Allyson also run a business that develops websites for artists called Art Hives, which segues them back into their art world. But with spring in full swing, Scott’s gearing up for a busy honey-producing season. Each of his hives produces 40 to 100 kilos of raw, polyfloral honey a year and customers at Maleny IGA and the local football club can’t get enough of it. He points to a large, stocky tree in his backyard – a rainforest tree called the guioa. Its nectar will eventually become honey with flavours ranging from caramel to slightly minty. It’s clear Scott pours his heart into the honey the hinterland locals will stir into their tea and drizzle on their porridge, and while he could scale up, he’s more concerned with quality and sustainability than quantity. Saving bees and making honey may be rewarding, but it’s not lucrative at this scale. So what motivates a smart person to do this for a living? “The thing that really appeals to me is that you have to be a bit of a backyard scientist,” Scott says. “You’ve got to be creative and you’ve got to be making decisions on the run. You open up a hive, attend a swarm, do a cut-out, there’s always a decision to be made. You’ve got to be a bit of a tinkerer, a builder, a bit of an inventor. I get to teach people and at the same time, I’m always learning.